V Knits: Go Sweater Go!!!!! I am smokin' with this sweater! I thought it would take ages but when you really love a project it'll just motor along! I'm just about a fifth up the other side and I've started the back piece on another set of needles. 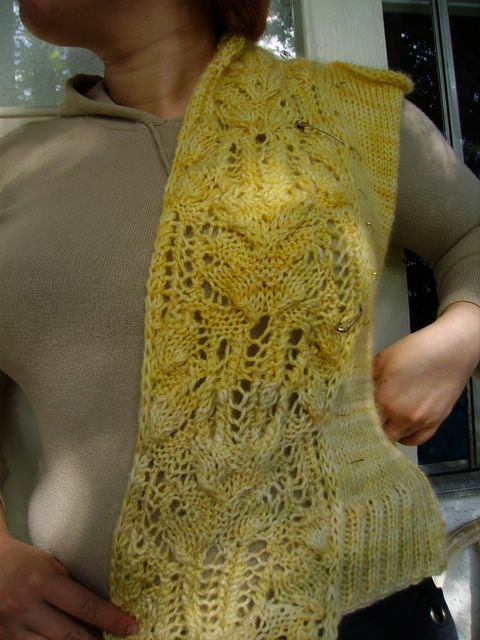 Here is a close-up of the lace pattern. I am still in awe of it! But at rate I'm going, I'll have to wait to be able to wear it. It'll be too warm until the fall. posted by Venus @ 9:28 p.m. I wasn't crazy about that sweater when I saw it in the the magazine, but your version is making me think twice. I love the color you chose and it looks like its going b=to be great!